Low sulphite wine is becoming a popular choice for those who prefer natural wines, but also for those who simple enjoy trying different varieties including organic and preservative free wines. There are a selection of low sulphite wines available with only minimal additives and these are made by dedicates producers. 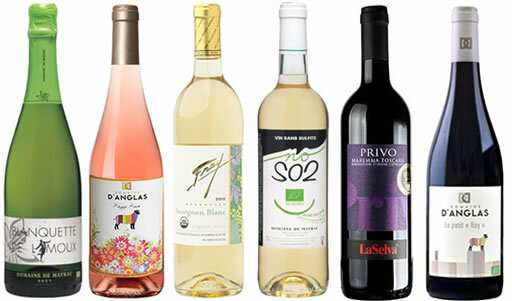 If you have a sulphite allergy and can’t tolerate even the low levels of sulphites, then there is a selection of quality sulphite free wines to choose from online. Low sulphite wines are generally far healthier than factory produced wines, which can contain up to 80 different chemicals. Why go for Low Sulphite Wine? When you opt to drink a low sulphite wine, as to the main-steam sulphite packed liquid they call wine, you avoid the awful short and long term after effects related to drinking it. Low sulphite and sulphite free wines are as close as you can get to natural healthy wines that are actively good for you, rather than bad. Many people choose to drink low sulphite or sulphite free wine because they have a sulphite allergy. While this is a correct decision, we must emphasise that this type of wine is not only for these people, it’s for everyone. The reason you might not know about natural wines is because the supermarkets – who make up to 85% of the wine industry in the UK don’t want you to. This is because low sulphite, sulphite free and natural wines are harder to make, costing more money and carrying larger risk. These factors, when applied to mass scale selling don’t bode too well for sheer money making, as they aim to do. Smaller independent wineries and retailers are the ones that are born through passion for good and healthy wine, where they have more than just money making in their interests. A good wine merchant will only stock wines that they would drink themselves – and in fact highly recommend to their customers.